In the year 238 BC, Cao Cao (Chow Yun Fat), The Prime Minister of Han Dynasty, ventured to the east and savagely defeated China’s greatest warrior Lv Bu, terrifying every warlord across the country before crowning himself the King of Wei. Meanwhile, young lovers Mu Shun (Tamaki Hiroshi) and Ling Jv (Crystal Liu Yi Fei) were taken from a prison camp to a hidden tomb where they spent five cruel years being trained as assassins for a secret mission. Over twenty years later, in the year 216 BC, astronomical signs began to predict dramatic change and as a result, Cao’s son Cao Pi (Qui Xin Zhi) and his followers urged Cao to become the new Emperor, unaware that opposing forces were plotting against him. The Killer and Crouching Tiger, Hidden Dragon star Chow Yun Fat returns in The Assassins [Tong que tai], an epic tale of love, power and betrayal. Filled to the brim with stunning visuals, Eastern promise and superstition, this historical tale of political intrigue and doomed romance boasts the visual talents of cinematographer Zhao Xiao Ding, a regular collaborator of Zhang Yimou who was nominated for an Oscar for his stunning work on House of Flying Daggers. 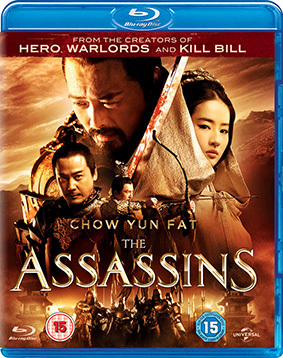 The Assassins will be released on UK Blu-ray and DVD on 9th September 2013 by Universal Pictures UK at the RRP of £15.99 for the Blu-ray and £12.99 for the DVD.